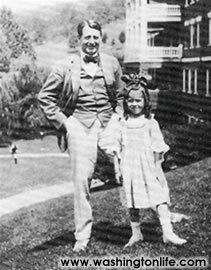 Harry Wardman and his daughter Helen shortly before WWI. When real estate agents describe their listings in Northwest Washington, they are always happy to add "It's a Wardman" if the house or apartment building was built by Harry Wardman, one of the most successful real estate developers in the city's history. Born in England in 1872, Wardman came to this country by accident. At the age of 17, he stowed away on a ship bound from London to Australia. When discovered, he was put off the ship in the nearest port, which happened to be New York City. From there he worked his way to Washington, D.C., where he found employment with construction companies. It was from these modest beginnings that he became the biggest and most influential builder in the city. His work spanned three decades and includes over 4,000 singlefamily houses, 12 office buildings, two embassies, one parking garage, eight hotels, two clubs, two hospital annexes and 400 apartment buildings. So great is Wardman's legacy that some houses, known as "Wardman Wannabes," had owners who went so far as to pretend their homes were built by the developer. Since he was responsible for building some 80,000 housing units from the early 1900's to 1938, the real thing can be found all over the city in neighborhoods such as Columbia Heights, Brightwood, Woodley and Kalorama. Among Wardman's achievements are the Northumberland and Dresden apartments, the Hay-Adams, Jefferson and St. Regis hotels and the British Embassy – and the man wasn't shy about his success. 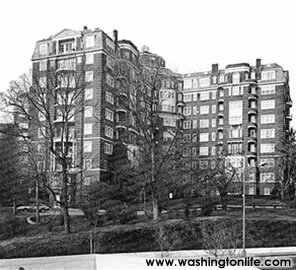 When he built seven buildings on R Street N.W., between 14th and 15th, he had the first letter of each building spell out his name: W-A-R-D-M-A-N.
Of all the properties he built, Wardman considered his crowning glory to be the Wardman Park Hotel and the Wardman Tower at the corner of Connecticut and Woodley. The hotel, now owned by Marriott, was called "Wardman's Folly" when it was under construction in 1916. Critics said it was too from the center of the city to be successful, but they were wrong – the hotel was soon filled to capacity. 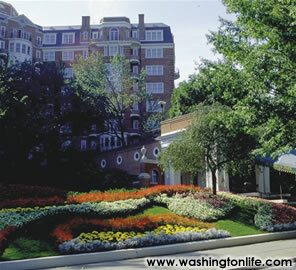 It was the largest and grandest hotel built in Washington up to that time, and one of the 10 largest in the country. Designed by Frank R. White, the building was patterned after "The Homestead" resort hotel in Hot Springs, Virginia. Among its special features were 1,200 rooms, a 200-by-45-foot lobby, a dining room seating 500, a Turkish bath, billiards room, drugstore and grocery. In his book Capital Losses, architectural historian James Goode described just how far Wardman would go to pursue a project. When he decided to add the luxury apartment tower to the hotel, he tore down his own home to clear the property while his wife was visiting Paris! Finished in 1928, the Tower turned out to be everything its creator envisioned. No other place in Washington was home to as many famous people. A partial roster of residents over the years included Herbert Hoover, Dwight D. Eisenhower, Adlai Stevenson, John Foster Dulles, Perle Mesta, Clare Booth Luce, Dean Rusk, Barry Goldwater, Lyndon Johnson and Caspar Weinberger. Unfortunately, Wardman paid more attention to the construction and design of his buildings than to his finances. The Depression found him short on cash and overextended. The developer lost his vast real estate empire, worth $30 million, and only managed to keep building houses because some of the land he owned had been deeded in his wife's name. Wardman built more than 1,000 houses in the 1930's, and was on his way to creating a second real estate empire when he died of cancer in 1938. At the time of his death, he estimated that 10 percent of Washington's population lived in "a Wardman."